With so many serious WWII flicks out there, it’s always good to sit down and watch a film that isn’t all about the horrors and trials of war. A film that is set during a very serious time, but has a much lighter and a seriously fun tone. Clint Eastwood reunites with Director Brian G. Hutton, who Eastwood had worked with two years prior on the World War II Drama Where Eagles Dare for Kelly’s Heroes. The premise is pretty straight forward. Kelly (Clint Eastwood), a former Lieutenant, who has been demoted to Private as a scapegoat in a military snafu, finds out from a captured German officer (by getting him drunk) that the Nazis have a fortune in confiscated gold bullion (40,000 bars worth 16 million) in a bank not far from their current position in the town of Clermont. The only problem is that it’s 30 miles behind enemy lines. So Kelly masterminds a scheme to sneak off and take the bullion, then ride off into the sunset. Kelly recruit’s the very outspoken “Crapgame” (Don Rickles); Master Sergeant “Big Joe” (Telly Savalas); Super positive hippy “Oddball” (Donald Sutherland) and the rest of his platoon of GI’s. Kelly’s Heroes is an offbeat film and a funny one too, with very high production values and one that is able to mix action packed filled set-pieces with smart character driven comedy. Eastwood does a great job as Kelly. It’s Eastwood just being Eastwood and it works perfectly. Big kudos go to Savalas, who grounds the film as the Master Sergeant who wants to take care of his men, either on the battlefield or trying to get his men into a hotel for some seriously needed R&R, but the standout of the film is definitely Sutherland that steals every scene as 40‘s hippie “Oddball”, who by not reporting the death of his commanding officer, is able to sit on the sidelines of the war with his hippie commune and not attack, but to defend if needed with his 3 Sherman tanks. With a film that is 40 years old, the Blu-ray transfer has come up really well. It’s not perfect and fully lush by any means, with some film grain still noticeable throughout, but this is the best transfer of the film around, so it can’t be argued with. It has enough good points in detail for it to be definitely worth the upgrade from DVD, with lush green woodlands, rain soaked soldiers, vibrant coloured explosions and burning fires that really pop from the transfer, but my favourite from the daytime scenes of the soldiers, with a muted and almost worn colour palette, that really reflects the spirit of the men, tired from the toils of war and all fighting. It’s a real standout. With all the new Eastwood releases out now, this one just boasts the films original theatrical trailer, which unfortunately, isn’t in HD. All in all, Kelly’s Heroes is a standout film from it’s time, with a smart, tongue-in-cheek script, an all star cast that give great performances, laughs galore and numerous action set-pieces of the highest calibre. 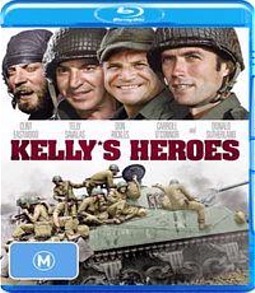 If you want a good night it with plenty of action and some smart laughs, then pick up this title and go for the gold with Kelly’s Heroes.